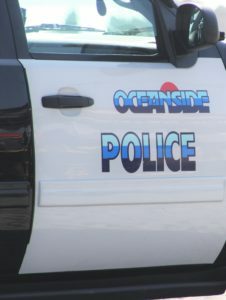 OCEANSIDE–Two men Friday were attacked and stabbed in a physical confrontation with four other men near The Strand in Oceanside, the Oceanside Police Department said. Authorities said the alleged gang-related attack occurred around 11:30 p.m. in the 200 block of The Strand South near the beach, Oceanside police said. The unidentified suspects, believed to be gang members, fled in a dark-colored SUV after the attack. Authorities are searching for those suspects. The two victims were transported to a local hospital to treat their stab wounds. They are expected to survive. Authorities said the victims were not affiliated with any gangs.